"What made you go to America, Swamiji?" "Rather a serious question to answer in brief. I can only answer it partly now. Because I travelled all over India, I wanted to go over to other countries. I went to America by the Far East." "What did you see in Japan, and is there any chance of India following in the progressive steps of Japan?" "None whatever, until all the three hundred millions of India combine together as a whole nation. The world has never seen such a patriotic and artistic race as the Japanese, and one special feature about them is this that while in Europe and elsewhere Art generally goes with dirt, Japanese Art is Art plus absolute cleanliness. I would wish that every one of our young men could visit Japan once at least in his lifetime. It is very easy to go there. The Japanese think that everything Hindu is great and believe that India is a holy land. Japanese Buddhism is entirely different from what you see in Ceylon. It is the same as Vedanta. It is positive and theistic Buddhism, not the negative atheistic Buddhism of Ceylon. "What is the key to Japan's sudden greatness?" "The faith of the Japanese in themselves, and their love for their country. When you have men who are ready to sacrifice their everything for their country, sincere to the backbone — when such men arise, India w ill become great in every respect. It is the men that make the country! What is there in the country? If you catch the social morality and the political morality of the Japanese, you will be as great as they are. The Japanese are ready to sacrifice everything for their country, and they have become a great people. But you are not; you cannot be, you sacrifice everything only for your own families and possessions." "Is it your wish that India should become like Japan?" "Decidedly not. India should continue to be what she is. How could India ever become like Japan, or any nation for the matter of that? In each nation, as in music, there is a main note, a central theme, upon which all others turn. Each nation has a theme: everything else is secondary. India's theme is religion. Social reform and everything else are secondary. Therefore India cannot be like Japan. It is said that when 'the heart breaks', then the flow of thought comes. India's heart must break, and the flow of spirituality will come out. India is India. We are not like the Japanese, we are Hindus. India's very atmosphere is soothing. I have been working incessantly here, and amidst this work I am getting rest. It is only from spiritual work that we can get rest in India. If your work is material here, you die of — diabetes!" "So much for Japan. What was your first experience of America, Swamiji?" "From first to last it was very good. With the exception of the missionaries and 'Church-women' the Americans are most hospitable, kind-hearted, generous, and good-natured." "Who are these 'Church-women' that you speak of, Swamiji?" "When a woman tries her best to find a husband, she goes to all the fashionable seaside resorts and tries all sorts of tricks to catch a man. When she fails in her attempts, she becomes, what they call in America, an 'old maid', and joins the Church. Some of them become very 'Churchy'. These 'Church-women' are awful fanatics. They are under the thumb of the priests there. Between them and the priests they make hell of earth and make a mess of religion. With the exception of these, the Americans are a very good people. They loved me, and I love them a great deal. I felt as if I was one of them." "What is your idea about the results of the Parliament of Religions?" "The Parliament of Religions, as it seems to me, was intended for a 'heathen show' before the world: but it turned out that the heathens had the upper hand and made it a Christian show all around. So the Parliament of Religions was a failure from the Christian standpoint, seeing that the Roman Catholics, who were the organisers of that Parliament, are, when there is a talk of another Parliament at Paris, now steadily opposing it. But the Chicago Parliament was a tremendous success for India and Indian thought. It helped on the tide of Vedanta, which is flooding the world. The American people — of course, minus the fanatical priests and Church-women — are very glad of the results of the Parliament." "What prospects have you, Swamiji, for the spread of your mission in England?" "There is every prospect. Before many years elapse a vast majority of the English people will be Vedantins. There is a greater prospect of this in England than there is in America. You see, Americans make a fanfaronade of everything, which is not the case with Englishmen. Even Christians cannot understand their New Testament, without understanding the Vedanta. The Vedanta is the rationale of all religions. Without the Vedanta every religion is superstition; with it everything becomes religion." "What is the special trait you noticed in the English character?" "The Englishman goes to practical work as soon as he believes in something. He has tremendous energy for practical work. There is in the whole world no human being superior to the English gentleman or lady. That is really the reason of my faith in them. John Bull is rather a thick-headed gentleman to deal with. You must push and push an idea till it reaches his brain, but once there, it does not get out. In England, there was not one missionary or anybody who said anything against me; not one who tried to make a scandal about me. To my astonishment, many of my friends belong to the Church of England. I learn, these missionaries do not come from the higher classes in England. Caste is as rigorous there as it is here, and the English churchmen belong to the class of gentlemen. They may differ in opinion from you, but that is no bar to their being friends with you; therefore, I would give a word of advice to my countrymen, which is, not to take notice of the vituperative missionaries, now that I have known that they are. We have 'sized' them, as the Americans say. Non-recognition is the only attitude to assume towards them." "Will you kindly enlighten me, Swamiji, on the Social Reform movements in America and England?" "Yes. All the social upheavalists, at least the leaders of them, are trying to find that all their communistic or equalising theories must have a spiritual basis, and that spiritual basis is in the Vedanta only. I have been told by several leaders, who used to attend my lectures, that they required the Vedanta as the basis of the new order of things." "What are your views with regard to the Indian masses?" "Oh, we are awfully poor, and our masses are very ignorant about secular things. Our masses are very good because poverty here is not a crime. Our masses are not violent. Many times I was near being mobbed in America and England, only on account of my dress. But I never heard of such a thing in India as a man being mobbed because of peculiar dress. In every other respect, our masses are much more civilised than the European masses." "What will you propose for the improvement of our masses?" "We have to give them secular education. We have to follow the plan laid down by our ancestors, that is, to bring all the ideals slowly down among the masses. Raise them slowly up, raise them to equality. Impart even secular knowledge through religion." "But do you think, Swamiji, it is a task that can be easily accomplished?" "It will, of course, have gradually to be worked out. But if there are enough self-sacrificing young fellows, who, I hope, will work with me, it can be done tomorrow. It all depends upon the zeal and the self-sacrifice brought to the task." "But if the present degraded condition is due to their past Karma, Swamiji, how do you think they could get out of it easily, and how do you propose to help them?" India you will find that attempts have always been made to raise the lower classes. Many are the classes that have been raised. Many more will follow till the whole will become Brahmin. That is the plan. We have only to raise them without bringing down anybody. And this has mostly to be done by the Brahmins themselves, because it is the duty of every aristocracy to dig its own grave; and the sooner it does so, the better for all. No time should be lost. Indian caste is better than the caste which prevails in Europe or America. I do not say it is absolutely good. Where would you be if there were no caste? Where would be your learning and other things, if there were no caste? There would be nothing left for the Europeans to study if caste had never existed! The Mohammedans would have smashed everything to pieces. Where do you find the Indian society standing still? It is always on the move. Sometimes, as in the times of foreign invasions, the movement has been slow, at other times quicker. This is what I say to my countrymen. I do not condemn them. I look into their past. I find that under the circumstances no nation could do more glorious work. I tell them that they have done well. I only ask them to do better." "What are your views, Swamiji, in regard to the relation of caste to rituals?" "Caste is continually changing, rituals are continually changing, so are forms. It is the substance, the principle, that does not change. It is in the Vedas that we have to study our religion. With the exception of the Vedas every book must change. The authority of the Vedas is for all time to come; the authority of every one of our other books is for the time being. For instance; one Smriti is powerful for one age, another for another age. Great prophets are always coming and pointing the way to work. Some prophets worked for the lower classes, others like Madhva gave to women the right to study the Vedas. Caste should not go; but should only be readjusted occasionally. Within the old structure is to be found life enough for the building of two hundred thousand new ones. It is sheer nonsense to desire the abolition of caste. The new method is — evolution of the old." "Do not Hindus stand in need of social reform?" "We do stand in need of social reform. At times great men would evolve new ideas of progress, and kings would give them the sanction of law. Thus social improvements had been in the past made in India, and in modern times to effect such progressive reforms, we will have first to build up such an authoritative power. Kings having gone, the power is the people's. We have, therefore, to wait till the people are educated, till they understand their needs and are ready and able to solve their problems. The tyranny of the minority is the worst tyranny in the world. Therefore, instead of frittering away our energies on ideal reforms, which will never become practical, we had better go to the root of the evil and make a legislative body, that is to say, educate our people, so that they may be able to solve their own problems. Until that is done all these ideal reforms will remain ideals only. The new order of things is the salvation of the people by the people, and it takes time to make it workable, especially in India, which has always in the past been governed by kings." "Do you think Hindu society can successfully adopt European social laws?" "No, not wholly. I would say, the combination of the Greek mind represented by the external European energy added to the Hindu spirituality would be an ideal society for India. For instance, it is absolutely necessary for you, instead of frittering away your energy and often talking of idle nonsense, to learn from the Englishman the idea of prompt obedience to leaders, the absence of jealousy, the indomitable perseverance and the undying faith in himself. As soon as he selects a leader for a work, the Englishman sticks to him through thick and thin and obeys him. Here in India, everybody wants to become a leader, and there is nobody to obey. Everyone should learn to obey before he can command. There is no end to our jealousies; and the more important the Hindu, the more jealous he is. Until this absence of jealousy and obedience to leaders are learnt by the Hindu, there will be no power of organization. We shall have to remain the hopelessly confused mob that we are now, hoping and doing nothing. India has to learn from Europe the conquest of external nature, and Europe has to learn from India the conquest of internal nature. Then there will be neither Hindus nor Europeans — there will be the ideal humanity which has conquered both the natures, the external and the internal. We have developed one phase of humanity, and they another. It is the union of the two that is wanted. The word freedom which is the watchword of our religion really means freedom physically, mentally, and spiritually." "What relation, Swamiji, does ritual bear to religion?" "Rituals are the kindergarten of religion. They are absolutely necessary for the world as it is now; only we shall have to give people newer and fresher rituals. A party of thinkers must undertake to do this. Old rituals must be rejected and new ones substituted." "Then you advocate the abolition of rituals, don't you?" "No, my watchword is construction, not destruction. Out of the existing rituals, new ones will have to be evolved. There is infinite power of development in everything; that is my belief. One atom has the power of the whole universe at its back. All along, in the history of the Hindu race, there never was any attempt at destruction, only construction. One sect wanted to destroy, and they were thrown out of India: They were the Buddhists. We have had a host of reformers — Shankara, Râmânuja, Madhva, and Chaitanya. These were great reformers, who always were constructive and built according to the circumstances of their time. This is our peculiar method of work. All the modern reformers take to European destructive reformation, which will never do good to anyone and never did. Only once was a modern reformer mostly constructive, and that one was Raja Ram Mohan Ray. The progress of the Hindu race has been towards the realisation of the Vedantic ideals. All history of Indian life is the struggle for the realisation of the ideal of the Vedanta through good or bad fortune. Whenever there was any reforming sect or religion which rejected the Vedantic ideal, it was smashed into nothing." "What is your programme of work here?" 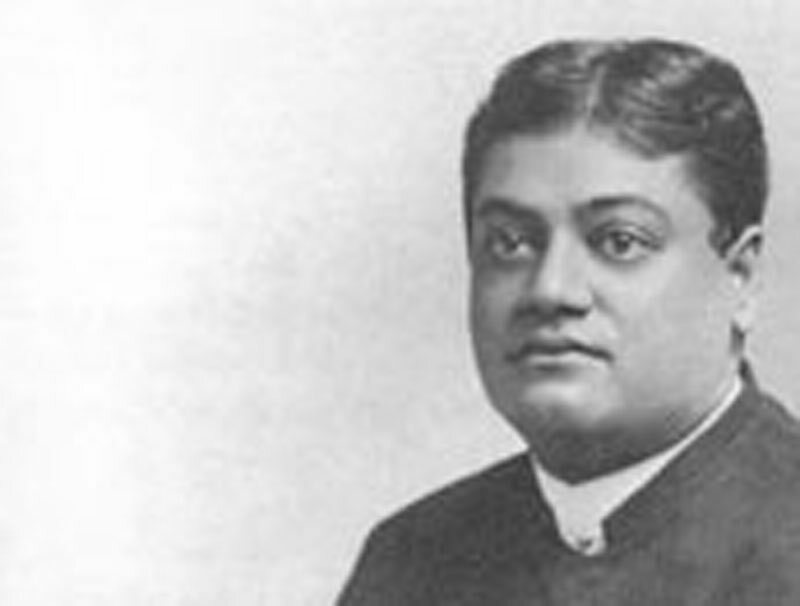 "I want to start two institutions, one in Madras and one in Calcutta, to carry out my plan; and that plan briefly is to bring the Vedantic ideals into the everyday practical life of the saint or the sinner, of the sage or the ignoramus, of the Brahmin or the Pariah."